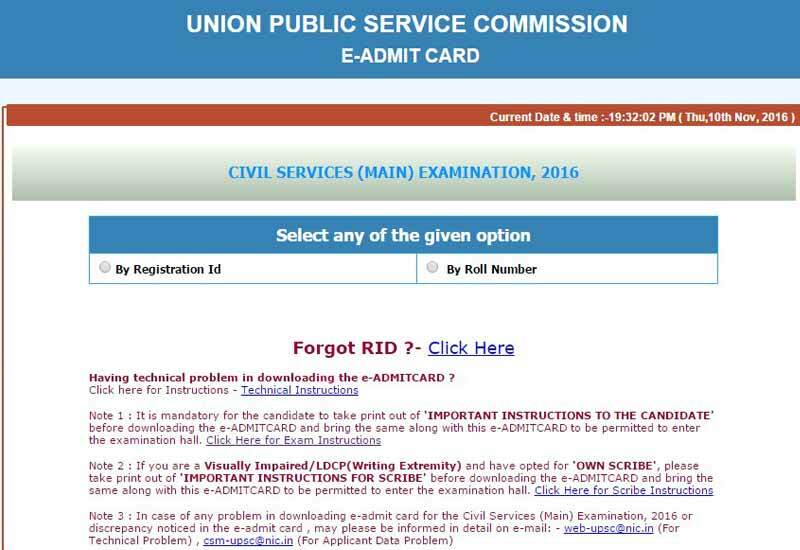 UPSC IAS Main 2016: The Union Public Service Commission (UPSC) has officially released the Indian Administrative Services Main 2016 admit cards today on November 10. The aspirants those who all qualified on the preliminary examination in August 2016. The Commission has provided time to download the e-Admit Cards from November 10 to December 9, 2016. Check the guidelines and get the UPSC IAS Main 2016 Admit Card. The officials have also provided some important instruction for the aspirants those who all going to attend the IAS Main 2016. Get all the complete details about UPSC IAS Main 2016 Admit Card. As per the official schedule, the Civil Service examination will be conducted on the first week of December. The exam will start from 3rd December and ends on 9th December. All these exam days have two sessions of the morning (09:30 AM to 12:00 PM) and afternoon (02:00 Pm to 05:00 PM). The session instruction also mentioned on the Admit card. So, don’t forget to note the exam session. Also, the exam centers also mentioned if the candidate has given the correct information on Detailed Application Form after the preliminary examination eligible results. More than lakh of candidates were applied for the administrative level of jobs in the government sectors. Keep the e-Admit card carefully and also read the complete instruction which given by the Union Public Service Commission. Scribe instructions also provided on the official website, if the candidate is visually impaired, then download the Scribe instructions along with Admit Card. The Officials have provided the e-mail to inform if any problem occurred while downloading the UPSC IAS Main 2016 Admit Card (web-upsc@nic.in). Kindly visit the UPSC official website. Click the “e-Admit Card: Civil service (Main) Examination, 2016” option on What’s New. The next page will appear along with the details of Examination Name, Document Type, and Online Application. Click on “Click Here” option in the Online Application to download the UPSC IAS Main 2016 Admit Card. Again a new page shows the Admit card issue date and end date along with the option “Click Here” to download the Admit Card. Click the option “Yes” at the end of the instruction which mentioned as after reading the Important Instructions. Select ‘By Registration Id’ or ‘By Roll Number’ option. Enter respective fields of Registration Id, Date Of Birth, Confirm Random Image and then click ‘Submit’ option. Download the PDF file and take a print. Keep the Admit Card as Safely while visiting Exam center on the exam date. If missed it, the exam supervisor wouldn’t be allowed to appear in UPSC IAS Main 2016 exams.